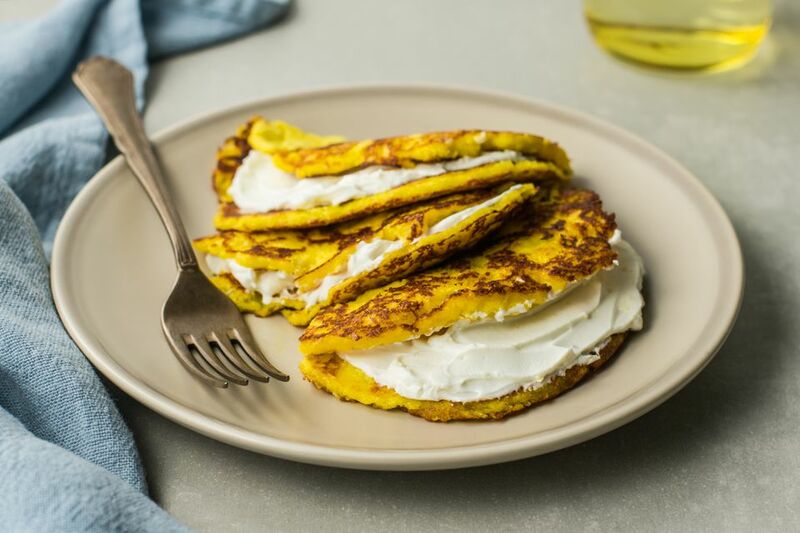 These sweet corn pancakes from Venezuela, known as cachapas, make the perfect breakfast. Cachapas are made with simple ingredients — fresh corn, a bit of butter, cream, and salt — and are a nice alternative to the average flour-based pancake. The recipe is as simple and quick as any other pancake recipe. Rather than serve them flat, these pancakes are soft and flexible and can be easily folded over a filling. It's common to stuff them with mozzarella or cream cheese, though they're equally delicious when simply served with butter. North American corn is sweeter and less starchy than typical South American corn, so a little cornstarch helps thicken the batter. Place the corn, cream, salt, melted butter, and cornstarch (if using) in a food processor or blender. Process until you have a fairly smooth, thick batter. Heat a lightly oiled skillet over medium-low heat. Add about 1/4 to 1/3 cup of the batter to skillet. Spread it with a spatula to make a circle. Cook the pancake until it starts to bubble and the spatula can easily slide underneath it. Flip the pancake and cook for several minutes on the other side. Keep the temperature on the low side, or the outside of the pancakes will burn before the inside is completely cooked. Continue cooking pancakes until you have used all the batter. Spread the pancakes with butter and cream cheese or top with grated ​queso fresco cheese. Fold the pancakes in half and serve. Cachapas can be filled with a variety of ingredients. For instance, you can spice up a cheese-filled cachapa with fresh cilantro and diced jalapeños. Sour cream makes a great filling as well. Some people also like to add a little meat, with diced ham and chorizo sausage topping the list of favorites. These pancakes also make excellent finger food for parties. Make the cakes about half the size, fill them with savory ingredients and fold them up into bite-sized treats. A Delicious Way to Recycle Tamales!